I recently returned back from Egypt where I had a wonderful holiday and a great booking experience. I got exactly what I paid for and expected. Hotel staff were helpful and friendly. We had a wonderful time and loved the climate and everything about Egypt. We stayed here from 4th july to 11th july. 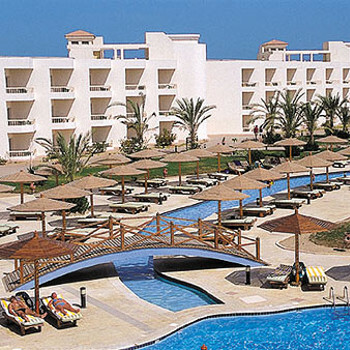 We have been to Egypt many times, to Sharm el Sheikh, and we had decided to try Hurghada. We picked the Hilton Long Beach as the pools looked great and it was 4 star all inc and we got a good price. We did check out the reviews and some were good , some were bad and we have always found thats what you get in Egypt, some people love it, some dont. I never expect to get the same 4 or 5 star food that you would get in the carribean as we have travelled all over and know that each country is very different. The food has never been a big issue for us as we have always found something we could eat from the buffet as we are not too fussy, and some hotels we have visited have been better than others. Firstly we booked with Thomson through our travel agents who matched an internet offer and we were very happy with the price. When our tickets arrived we noticed that we were flying with first choice. The plane was old and small, 3 seats and 3 seats across. We arrived on time and check in went well until i asked about our room, which we had for 2-3 adults. My son is 15 years old and 6ft 4ins tall so when booking one of the first things i asked was that the room would not have a camp bed as it would be too small for my son. The usual rule is that a camp bed is only suitable for a child under 12 so when they assured me that the room was for up to 3 adults i relaxed and believed them as we have always had 2 queen sized beds in the past and that has been fine. When we were shown the room there were two singles and a tiny camp bed with wafer thin matteress and my sons legs were over the bed from the knee down and it was colapsing!!. We had to go back to reception where they tried to ask us to wait until tomorrow to sort it out but i was firm with them as my son would not be able to go to sleep!! They realised that they had to sort it and they came to take the bed away and bring in another camp bed which was full size and so we settled with that as by this point we were tired out and he could fit in it enough to sleep on - even though it was a metal frame and on wheels which moved around when he turned over!!!. The only requests we had asked for was a high floor - we were put on the ground - and a quiet room - we were overlooking the pool and thats where the "singer" was ( terrible - but very funny ). The bathroom was very big and the shower was great. Tv , alarm clock , hairdryer in bathroom . The maids cleaned the room very well. The only problem we had with the room was when i turned one of the lights off at night just before we were going to sleep- there was a loud bang from behind the switch which made me jump!!!! our electrics went off including the air con so we had to ring reception - around midnight - to ask them to come and fix it . We waited for half an hour and were just about to ring again when they rang us to see if it was working now??? did they think it could fix itself ??? We said no, no one had been to fix it so how could it be?? They sent a man about 15 mins later who opened up the ceiling and i think that there was a trip switch or fuse and they got it to come back on again. We went to the welcome meeting and recieved the usual run down on the hotel facilities which you could use and which you could not plus a brief description of trips available- our rep- Omar- managed to tell us some wrong information - the lobby bar is always full and we were told that the aqua bar - outside the front of reception to your left - "is against extra charge" . We were desperate one night for a seat and decided to go over there and pay if we had to only to find out that it is all inclusive. It was cool and comfortable - no smoking - but you could smoke just outside it - and best of all plenty of seats - is this because everyone thinks you have to pay for drinks????? The mahayma island trip - the island was beautiful, the boat ok - no room left in the shady bit in the top so if you want to stay out of the sun you were out of luck - but it was only 45 mins to the island, lunch was the best food we'd had so far and didnt realise how hungry we were until we started eating!! !, you have to buy all your drinks - 20 LE for sakara gold bottle, 10LE for coke. The only thing i disliked about the trip was when you get off the boat you cannot choose where to sit - the mahayma island staff took you to your area - wicker mats on the beach for you to put your towels on, asked you how many in your party and then pointed to the mats you were allocated . The guide was not very good with his explanations of timings - his english was not good. You got to the island at about 12pm, if you want to go on a snorkelling trip you had to meet him at the jetty at 1.30pm and this was suposed to take 45 mins, then lunch was at 2.30pm. If you want you can stay on the island and not go snorkelling and then you meet at 6.30pm to get back on the boat to go back. The snorkelling trip was late getting back - about 3.20pm and so we were hanging around waiting for them to get back so as we knew where to go for lunch. At lunch you are told which seats to have so we found ourselves at the table with a russian family who were clearly not pleased that we had been told to sit with them. There wasnt much in the way of talking from the guide , no entertainment - no games on board and no show on the island so older kids were bored - its just a beautiful island with lovely sand to sunbathe on. I think 6 hours is too long, especially if you are told to sit where there is no shade. We also went on the Arabian nights trip. We were picked up at 5.30 and we thought we were going into the desert ( good job we werent as the driver didnt know where he was going and kept taking wrong turns and reversing back!!!) to a camp for an evening out and for entertainment. We only travelled for about 15 mins and we were there. It was the place that you go for the quad bikes and a purpose built centre for entertainment. When we arrived there were only us with two other families there. We were shown to a tent in a corner of the place and told to get our food. We had no guide with us !!!!!!! We were given orange juice which the flies loved. The food was disgusting and the meat was not cooked properly. We then found out that our guide would be joining us later. The show was not due to start until 7.30pm - so that left us with no guide and twiddling our thumbs for an hour and a half. It soon became apparant that our arabian nights trip was not going to start until the quad bikes came back as they were eating there and watching the show too. Also the other people who had booked this trip arrived around 7.30 ish so they had not had to wait like us. The show started at about 8.15pm , it lasted for an hour and that was it. The cameramen - there were 3 of them making a video/dvd for you to buy of the show, kept getting in the way so you couldnt see properly - a good way of making you buy the dvd - to see what you should have been able to see!!! ALSO if we thought it was an evening out to chill with a beer it is not. You cannot buy alcohol - there wasnt any. The coke was 10 le per can. We did a similar trip with thomas cook in sharm last year and had a ball. Our rep came with us and joined in the dancing - we had camel rides - it was deep in the desert with mountains surrounding us with fresh bread, good food and beer included in the price. What a very poor difference there was with thomson. We all filled in complaints forms at the end of the night. rooms clean, staff lovely and extra nice if you tip, pools good. There is a good indoor play area for kids to get them out of the midday heat - a large soft play , indoor bouncy castle and some arcade games for older kids, pool tables and air hockey. racing games etc. Huge and full of Russians. There were dirty nappies thrown on the pavement by the pool, Guests push in the queues, they put their fingers into the food and lick them!! Kids play with the fruit - they took loads of oranges and pears in their t shirts and played games with them in the reataurant and then took them back to the serving area and put them back - after being kicked around on the floor!!!!! We witnessed many arguments over towels and sunbeds - one resulting in two young german women in tears from a large party of Russian guests who had nicked their beds and towels and took great pleasure at cursing at them and laughing when the women were reduced to tears. FOOD - what can i say ??? everyone has different standards - I had complained twice regarding the food - the first time there was literally nothing to eat - the stuff they had on display was almost gone and had dried up to the point of no return - i opened up a piece of fish with my fork and the smell that came out almost knocked me out!!! The waiter told management that we had not eaten and he hurried over to offer us a fresh meal of steak and chips which we accepted and they took 45 mins to cook it and bring it to us but it was lovely and worth the wait as we were so hungry!!!! The second time there was blood covered chicken pieces on offer with a strange stuffing !!! The lids had been left open by other guests and the staff dont notice even when the guests touch things with their fingers !!!!!... the food was cold - a pasta type thing was freezing and sticky - even the jacket potatoes were cold as ice!!!! The salad bowls are not kept cold - darent eat any of it as it had prawns and egg in it. The rice is hard - they dont cook it long enough and the cold pasta in salad bowls is hard, The cooked pasta is overcooked so very stodgy and never even warm!! We were given a complementary meal at the a la carte as we had sat down with the food and beverages manager and explained in detail what we were unhappy about regarding the food - it was called the marhaba- it was very good , we went on a thursday night and we ordered off the menu and had a show - we had prawns to start, soup and steak and it was all cooked perfectly and was served hot. The show was good and even better than what we had got on the trip.... The downside was that several hours after i had eaten this meal i had terrible tummy cramps and had to run to the loo several times. The chemist does a good trade in tablets -antinal - but they work well so after 1 and a half days it settled down. The day before we were leaving i asked for a late check out room as we were not being picked up until 7.15pm and check out was 12pm- they tried to say we couldnt have it as the hotel was full but i asked if all our luggage would be safe - the guy asked in the back and told someone i wasnt happy about leaving our passports and luggage in an unlocked room ... then they agreed for us to have the room until 6pm so that was fine - 380-LE!! but this kept our wristbands also so that was ok.
Our last day i checked out at 6pm, the guys came to collect our luggage . Omar appeared just after we had done this to tell us that we had a 2and a half hour delay. Next it was 3 and a half hours. Due to a technical fault with the plane. We realised that our pick up time was now 10.30pm and we hadnt eaten anything at lunch as we thought we would get better food at the airport - now we had to buy drinks and not have dinner. We realised that itwould be more expensive to pay for drinks and food seperately so had to buy back our wristbands at 250 LE for 3 of us. This entitled us to dinner and drinks until we left. We went into dinner to get some food and through the window we could see the bbq outside where they were cooking kebabs. The heat outside was still over 30 degrees and the fresh meat was out with no covers on and crawling in flies!!!!!! They were cooking it and serving it still pink - i pointed it out to management and they haistily covered the meat up but instead of throwing it away they still served the food already cooked and cooked the meat which had been crawling mins before. They asked us to move tables which i refused - so then they moved the meat so i could not see them serving it to other guests. They haistily cooked us a fresh meal of steak and chips to shut us up. By this time i was beyond arguing and couldnt wait for the coach to pick us up. people had complained about the alcohol - i am not a spirits drinker so only had sakara and soft drinks which were fine with me but the diet coke does run out all the time . the coffee is ok but a little strong and the milk is put out in jugs on the tables so goes off easily ... i got my milk from the thermos flasks. the best coffee was in the lobby bar ( when you can get a seat) from the machine there. They have lovely drinks advertised on the table menus made with chocolate but only had the coconut variety available which my son did not like. The hotel was very clean the pools could of done with a bit more attention. The food was awful hardly any choice an what you could find to eat was cold.the hotel is on a lovely beach an some snorkeling if you walk out a little bit. The staff are very helpfull and polite and will ensure you get a sunbed each day for a small reward.the entertainment was as bad as the food awful the same singer on each night. We would like to say we would return to this hotel but due to the very poor food on offer wont bother. We were looking forward to staying at the hotel as we had been on a weeks nile cruise an wanted to relax but we went hungry an just ate a bit of breakfast each day toast and tea. We found the hotel to be very clean and gardens kept lovely. We were given a room in a villa practically on the beach where we spent most of our time. The sea was lovely and we could walk in shallow water for ages before it deepened. There is nothing outside of the hotel except half a dozen shops. Any staff that we had dealings with were very helpful. The beach boys would save beds for you if you give them a little tip. Only one bar for us to use called the Aqua bar, this has not been opened that long but it was very nice. Entertainment not much excep a female singer on a couple of nights and a guitarist/singer on a couple of nights. Thank goodness this bar was there as lots of people in the bar at the reception area. Because of it being a smoking bar it really was smokey. The food was not very good. Breakfast fine, but lunch and dinner was not to our liking. On speaking to a couple who have been going to this hotel for four years, they said that the food had definitely changed for the worse. I would try this hotel again maybe in two or three years. We were a bit aprehensive about this hotel after reading mixed reviews but I can honestly say we had nothing to worry about the hotel is lovely. It was our silver wedding anniversary so our children upgraded us to a villa type apartment looking out onto the sea. It was really lovely especially at night. The routine rooms also looked nice. The beach is artificial but that didnt bother us because the sea is so good, so clear the differnt fish you can see is wonderful. The hotel was extremely clean our rooms were cleaned daily and fresh towels also every day. The food was good there are two restaurants one Italian and the other themed with different meals each night from around the world, we had no trouble at all finding something to eat which suited all of us. The hotel is a bit out of the way but it didnt bother us. We stayed by the beach on the days we were not sightseeing and just relaxed. We visited Cairo and Luxor as well as seeing Hurghada town. Entertainment is not too great just people singing and there is a small area for dancing, but it suited us. Would we visit this hotel again, definately already booked for next year. This is our second year at this hotel. The rooms are very clean and tidy and cleaned every day. Spacious rooms for all the family. The hotel is always looking clean and the staff are always working hard to make it look at its best. Hotel food is repeated in the second week but its tasty and cooked well. Yes it can be much of the same thing but its a good enough buffet style restaurant. If you do get alittle fed up with the main restaurants you can do as we did and use the Pizza Bar or the Marhaba Restauarant. I know you won't be dissappointed with these restaurants as even though you pay for the food they both are excellent. The hotel is in middle of nowhere but thats how I prefer it. I did go with the family into Hurghada Town on an evening for a change and it cost 3 pounds by taxi. We had a great Mcdonalds at such a cheap price and met loads of locals which was good fun. During our stay we did suffer upset tummys and this wasn't due to the hotel in any way but too the sun and change. I would like to advise if you have a tummy bug in Egypt to get hold of 'Antinal' its a intestinal antiseptic drug and can be purchased in main Hurghada Town Pharmacy for about 10 egyptian pounds which is 1 english pound for a box of 12 capsules. This is very good tablet and will work better than imodium in the sense it kills the bug in your tummy rather than holding or stopping bug. Take a visit on the quads to the desert and see the locals. Plus a visit to the local Aqua Park in the Titanic Hotel. This was fantastic day out for all the family. Don't book through your tour operator use the men that work around the pool in the day. They give you same offer for better price. You can catch the main man who organises these trips in the hotels Aqua Bar on an evening ( he sits in corner with television to advertise good trips). You can rest assure that they really look after you and the family. The hotel staff are excellent infact so happy and helpful at all times. The bar pool staff where great and friendly to the children and ourselves. Not many resorts remember each of our names, this made our holiday even more special as we made good friendships with them all. Look out for Mohamed, Aly and Saied. The Aqua bar was new to the resort this year and its a great place to chill out in well air conditioned rooms and great space. Good for a chat and drink. The children loved playing in the soft play area upstairs and it only cost alittle to play. The entertainment this year was good for the children to watch but personally after long time in full sun all day I prefered chatting to new friends and drink in quiet area by pool bar and listen to the singers. Daytime activities were great fun. My son enjoyed the darts and football activities with Eddison. I will return to this hotel again in the future. Hopefully it will keep changing for the better as it is a super place to go. The hotel cleanlines was great, we have very nice person to cleaning. The food was delicious, especially arabic cousine, but you should serve more seafood. Hotel location was nice and comfortable. The Entertainment team was very talented and funny, especially Paulo. I would like to visit the hotel in next year. The hotel itself is lovely but spread out over a large area - some rooms are a very long walk from restaurants, reception, bars etc. The staff were very friendly and helpful - nothing was too much trouble - 'please' and 'thank you' and a smile go a very long way! We liked being outside of the main resort of Hurghada and the beach was good but the snorkelling is not as good as Sharm. Oh dear, where to begin, we had a Nile cruise first week and should have chosen to stay in Cairo for the following 3 nights, prior to returning to Luxor. Unfortunately we choose this hotel and regreted that decision the moment we arrived. If you enjoy Butlins / Pontins style holidays this will suit you Ok, but beware to expext a really poorly stomach as we all suffered from the the "tepid" food that had clearly been left out for some period of time in the resturant that would have benifited from air conditioning. All inclusive it is not, you will pay extra for most things you can think off. Early risers around 6am will have the luxury of being able to reserve a sun bed around the main POOLS, which if you relish a frozen plunge pool you wil be in your element. The TV channel selection is really great and gets top marks, with wall to wall Football coverage, which include all the live UK premiership games.